A Total Of 12 Matches Were Played Today Of The Ongoing FIFA World Cup 2018 Friendly Matches. The Match Wise Highlights Of All 12 Matches Are Appended Below. This was the last match of the Irish defender, John O’Shea’s and his team gave him a wonderful farewell as they won the match against USA. The match was competitive from the very beginning as both teams were displaying their intent to win this match. And, just as the 1st half was coming to end Bobby Wood scored in the 1st half injury time to put USA in the lead. Now, Ireland had to win this match as they were on a 3-match losing streak and losing this match would have been disastrous. This is where Burke came in handy as the Irishman didn’t waste much time to score in the 2nd half to make it 1 – 1. The scores were now level and the match just became much more interesting. Both teams were now trying to have more ball possession and take their shots at the goal to score a tie-breaker. 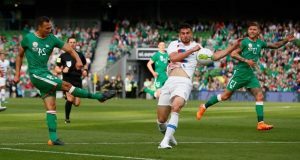 However, USA failed in this objective but Ireland didn’t as the substitute Alan Judge’s 90th minute goal handed the victory to Ireland on a silver platter. Iceland had managed to take their spot in the upcoming FIFA World Cup 2018 while Norway had failed to qualify for the mega event. Nevertheless, the Norwegians were still pretty determined to win this match against Iceland who seemed to be the clear favourites. But, it was Norway who opened the scoring in this match as Bjorn Johnsen scored the first goal of this match. Apart from these 2 no other goals were scored as the first half came to an end with the total score being 1 – 1. After the break, the 2nd half went underway as both teams searched for a tie-breaking goal. And, it was the favourites of this match i.e. Iceland whose player Sigurdsson who had come back from a knee injury scored the goal to put his team in the lead. Only 10 minutes had left in the match and the score was 2 – 1 with Iceland in the lead. This is when the Sunderland striker Joshua King struck as he netted the ball at the 80th minute to level the scoreboard. And, shortly after that it was Alexander Sorloth of Crystal Palace who netted the winning goal as Norway beat Iceland by 3 – 2. Honduras had the upper hand in this match as their record against El Salvador was quite excellent. They had managed to beat their opponents 3 times and were looking to replicate their performance once again. However, this was not the case today as El Salvador had come prepared. And, they showed their preparations in the 1st half when Pineda struck at the 19th minute to put them in the lead. Honduras had no answer to El Salvador defence as the 1st half came to an end with El Salvador firmly in the lead. Honduras came back strongly in the 2nd half as El Salvador did not manage to by-pass their defenders. But it didn’t matter as Honduras themselves failed to score a goal in the 2nd half as El Salvador won the match in the end. Having won their place in the FIFA World Cup 2018, Mexico were the favourites to win this match against Scotland. An early goal was always going to put pressure on the Scottish team. Scotland had made 7 changes to their team but not one of them was looking quite compelling for them to level the score. Moreover, their passing was not too meaningful. Plus they were constantly giving away possession to the home team who were quite happy to take it every now and then. Among this confusion the 1st half came to an end and it was Mexico who were leading by 1 – 0. The 2nd half started and the same story repeated itself as Scotland showed their incompetency against Mexico. However, there was a point when Scotland came near to scoring a goal but couldn’t convert their chance as the match came to an end. 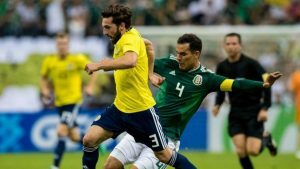 It was a great win by Mexico who would be happy to gain momentum from it before the FIFA World Cup 2018. It was time for the only high-profile match of the day as Croatia faced Brazil who are strong contenders of winning this year’s FIFA World Cup 2018. The Brazilians had won their last two matches and were running high on confidence. On the other hand, Croatia had won only one of their last two matches. So, the match started as both teams intended to score in the 1st half and get in the front. But, Brazil managed to wave these attacks as the 1st half ended with the score being 0 – 0. Brazil were now in the lead by one goal and Croatia needed to score to level the scoreboard. Late substitutions were now being made by both teams as Brazil looked to win and Croatia were intending to at least draw this match. But, Brazil were never in doubt of the result and it was sealed by Firmino who scored at the 93rd minute to seal the victory for Brazil. After this win, have now won 3 consecutive matches and if they continue this form they will be one to look out for at the FIFA World Cup 2018. This was the 3rd match that Albania lost as Ukraine demolished them by scoring 4 goals. Ukraine, who had been able to qualify for the FIFA World Cup 2018 were pretty determined to win this match and boost their confidence ahead of the mega event. On the other hand, Albania were simply looking to win this match after not being able to qualify for the FIFA World Cup 2018. So, the match started and as expected Ukraine’s Yevhaen Konoplyanka struck the first goal of the match to make it 1 – 0. Ukraine weren’t done yet as Tamolenko returned at the dying moments of the 1st half to strike another goal and take the lead to 3 goals. Albania had been outclassed in the 1st half but they came back strong in the 2nd half as their defence looked much stronger. But, they were still lacking in the attacking department as no goals were being scored by them. The match was coming to an end and this is when Ndoj struck at the 88th minute and Albania got their first goal of the match. And, with this goal the match ended and Ukraine registered a massive victory over Albania. 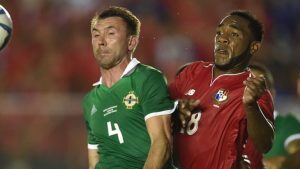 Both Costa Rica and Northern Ireland had qualified for the upcoming FIFA World Cup 2018 and now they faced each other in a friendly match. The Irish boss O’Neill’s experiment to play Johnny Evans in the midfield role failed miserably as Costa Rica thrashed Ireland by 3 goals. Costa Rica managed to take the lead in the 1st half as Venegas scored the opening goal to start the proceedings. In reply, Northern Ireland couldn’t muster up a single goal as the 1st half ended with Costa Rica firmly in the lead. The Irish needed to regroup and attack but they got a surprise as Campbell scored 1 minute into the 2nd half to extend the lead even further. Irish defenders were clearly struggling, especially Aaron Hughes who was not coping well with San Jose heat. This weakness was exploited by Costa Rica as Calvo scored at the 66th minute to make it 3 – 0. This was also the final score of the match as Northern Ireland were defeated. And, it was Joel Campbell who was the man of the match for his exceptional play and a wonderful goal. Peru had managed to reach the FIFA World Cup 2018 with full force as they had failed to reach this mega event since 1982. And, they showed their class against the Saudis too as they won over them by 3 goals. The goal scoring was opened by Andre Carrillo as the netted the ball at the 20th minute to make it 1 – 0. Then it was time for Peru’s captain to show his world-class skills as he scored at the 41st minute to make it 2 – 0. This marked the end of the 1st half as Peru led the scoring board with Saudi Arabia scratching their heads on making a strategy of coming back in this match. But, the comeback never happened as Peru’s captain Guerrero lead by example and scored at the 64th minute to seal Peru’s victory in this match.